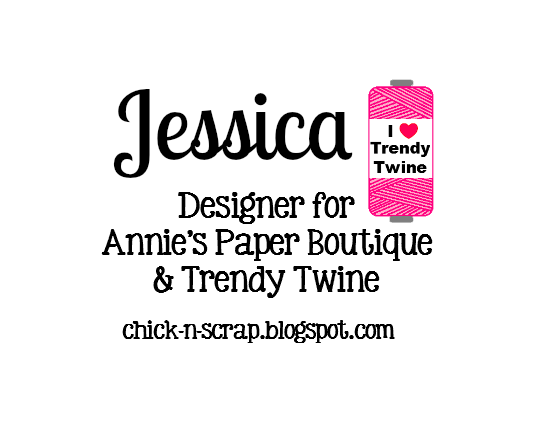 Trendy Twine - Warm Winter Thanks! 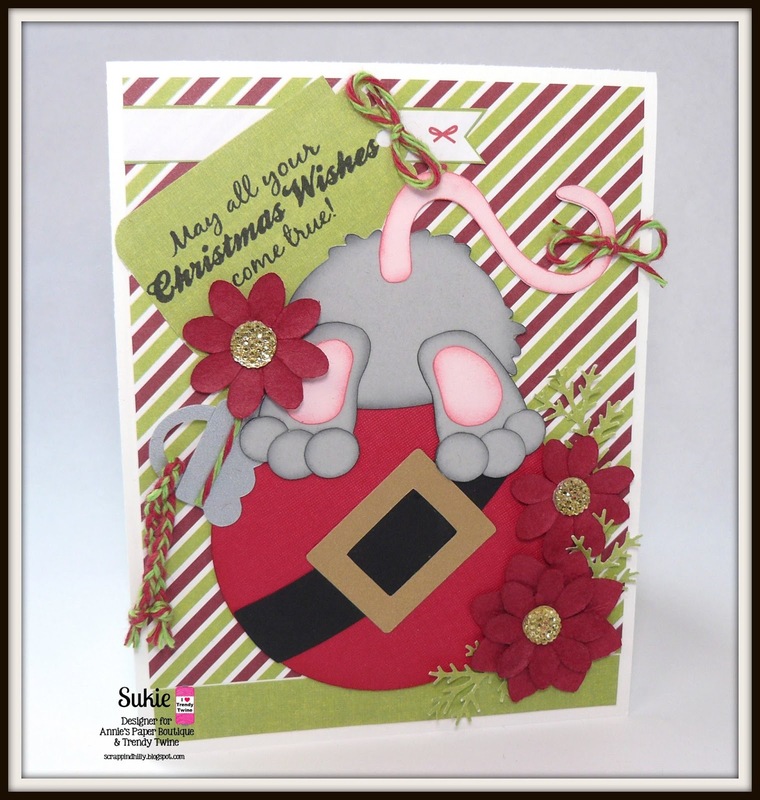 This is Shelly from My Paper Love sharing a Winter Thank you card showcasing Holly Berry Trendy Twine. Now that Christmas is over I'm sure you have some people to thank. We definitely have many thank you cards to write. So to get me started I used a simple design and the gorgeous Holly Berry Trendy Twine. 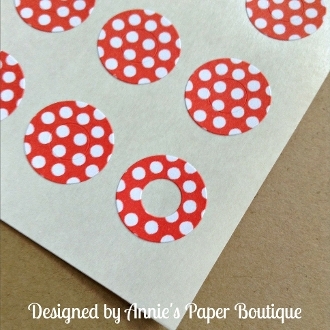 I started by cutting an A2 size pattern paper using a wave die cut. I adhered them to Kraft card stock. 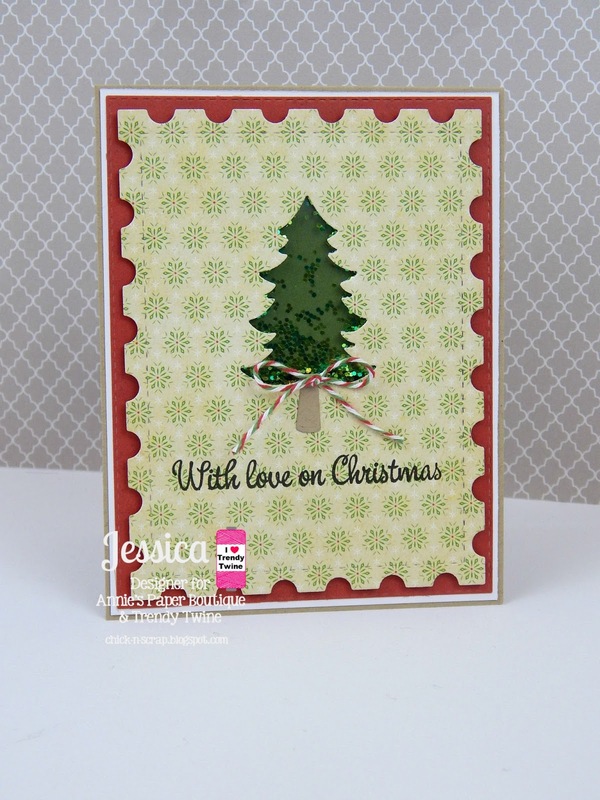 I stamped the sentiment and then lined both edges with Holly Berry Trendy Twine. I used a die cut tag and snowflake and topped the tag off with more twine. But this time I untwisted some of the twine... You'll see me do more of this, it looks so pretty! Lastly, I added a tiny little pom pom in the middle of my snowflake. Then I placed the card in my tree and snapped a picture. For the record I'm going to miss my tree, it provided the best light for picture taking. Hello everyone! I'm Helen from HTB Creations. 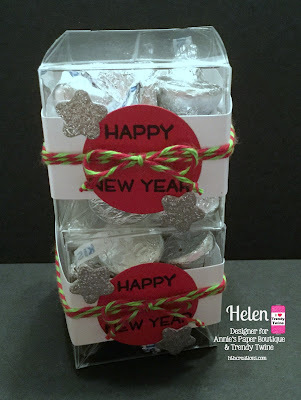 Today I have some quick treat boxes that you can give out on New Year's or a New Year's Eve Party. 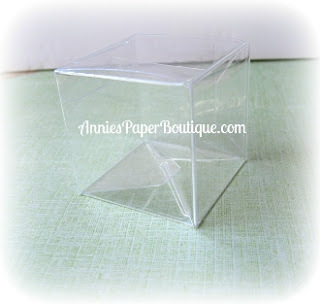 I used the 2x2 Clear Boxes that you can find in the store along with the fabulous Holly Berry Trendy Twine. First, I filled the 2x2 box with some silver Hershey Kisses. Next I cut a 1 inch white card stock and wrapped it around the box. 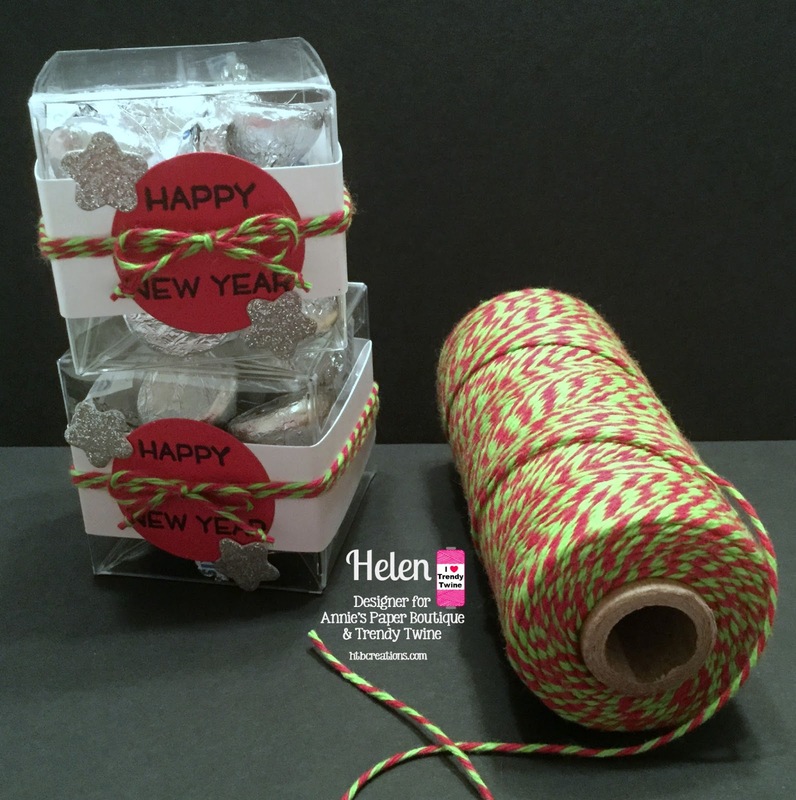 I cut a red circle out and stamped the happy and new year at the top and bottom of the circle so I could wrap my Holly Berry Twine around and tie the bow in the middle. Lastly, I added 2 silver stars I die cut to the front with pop dots. It's Tammy, from Creating Somewhere Under The Sun. I hope you had a wonderful Christmas! It's a little bare under the tree, and it's time to think about thank you notes to show appreciation for those thoughtful gifts. 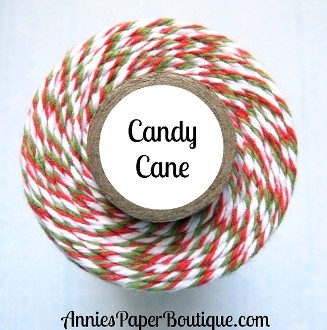 I have one to share today featuring Candy Cane Trendy Twine. I started with a red card base and then pieced together two patterned papers from my stash. I took a length of Candy Cane Trendy Twine where the papers met. 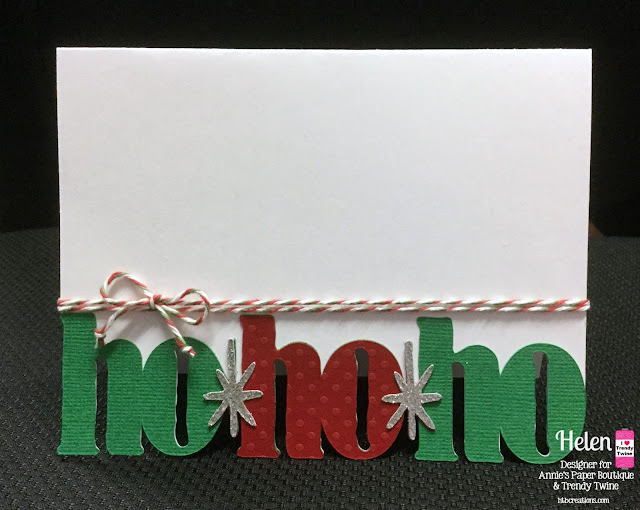 Next, I die-cut a tree from patterned paper and trimmed it with some more Candy Cane Trendy Twine adding to the left side of the card front by adhering with foam adhesive. 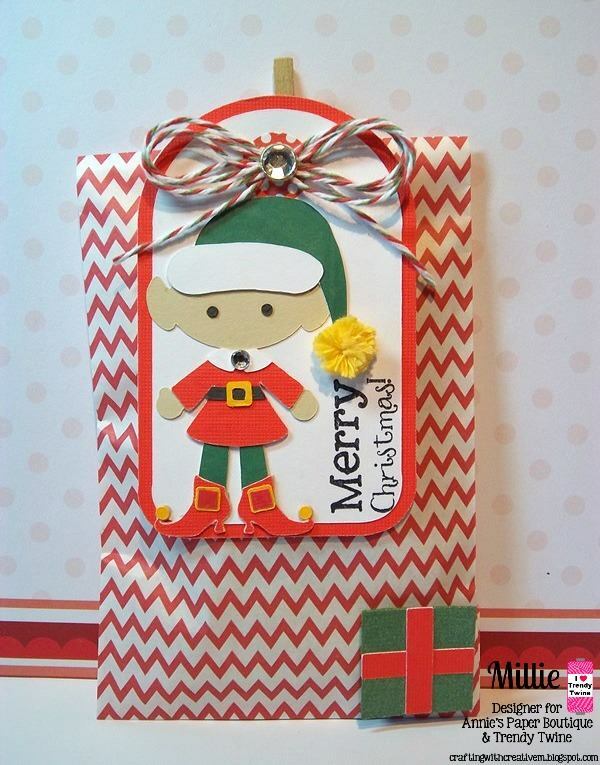 I stamped my sentiment adding a Candy Cane Trendy Twine triple bow to the top. Angeline here to share with you my final project as a Little Sister. I had lots of fun and felt so welcomed by Lesley and all the DT team. Thank you all. It did take me some time to make this, but I think it's a cute addition to my tree. 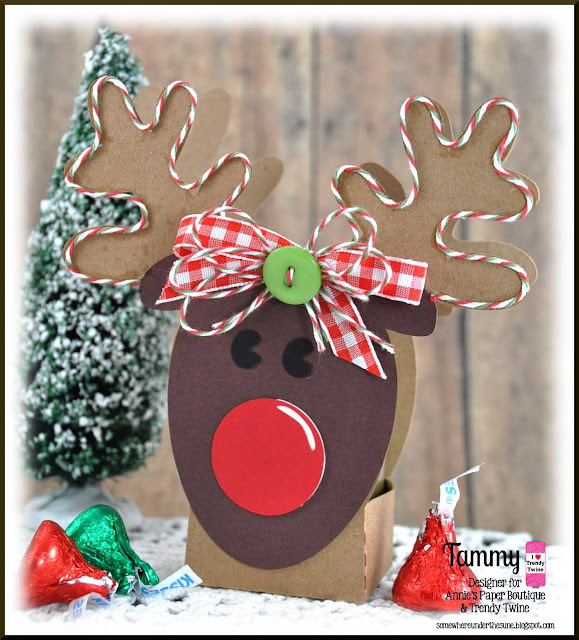 The Trendy Twine DT is sharing the blog today with some super ADORABLE holiday projects to continue the Christmas Day celebrations! 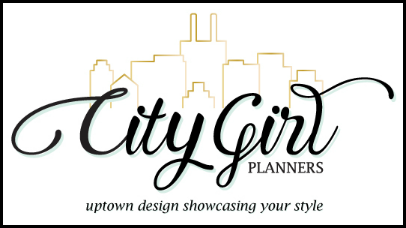 You can click on each designers name to check out more details on their projects. Feel free to leave them some bloggy love too~ I know they would appreciate it! I hope you have enjoyed alittle more Christmas inspiration from the DT! 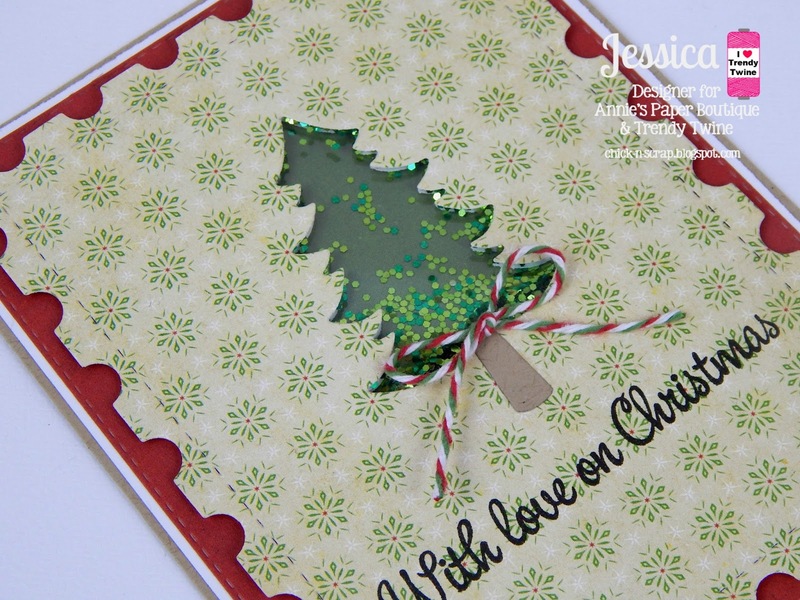 Jessica here from Chick-n-Scrap with my final Christmas card of 2015. Before I share my project I just want to wish everyone a very Merry Christmas and Happy New Year!It is so hard to believe that another year is almost in the books. It has been an awesome year for me and I hope it has been for you as well! I also want to say that I hope you will stop by tomorrow to see all the gorgeous Christmas projects the DT has to share!! For my card, I wanted to make a mini shaker using the adorable tree die from MCT. In my travels to Michaels, I was able to pick up some chunky glitter in the Christmas section that I was just dying to use. It was kinda a mess to add to my shaker.....sequins would so much better (you can find them HERE) but the end result I think is very pretty. 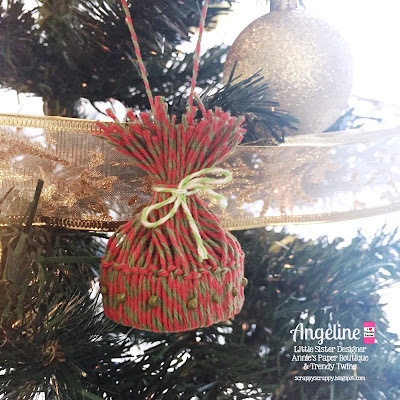 After making my shaker and adding my sentiment, I used my featured twine color of the month~ Candy Cane Trendy Twine and made a bow to add to the base of my tree. The perfect extra embellishment to finish off my card! Thanks so much for stopping by today! I hope everyone has a wonderful Christmas Eve! It's Tammy from Creating Somewhere Under The Sun! I'm sharing some cute tags I created trimmed out using Candy Cane Trendy Twine. Hello crafty friends! Beth from Beth's Beauties here with you today. 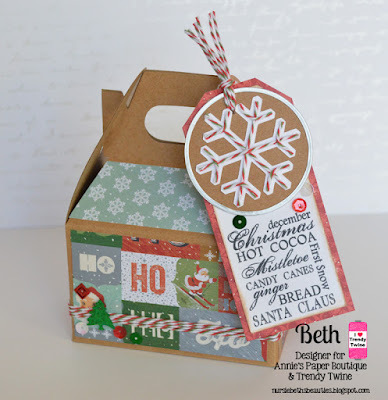 I decorated a Kraft Gable Box to fill with Christmas goodies! First, I added paper from DCWV's Oh What Fun stack on the Kraft Gable Box. 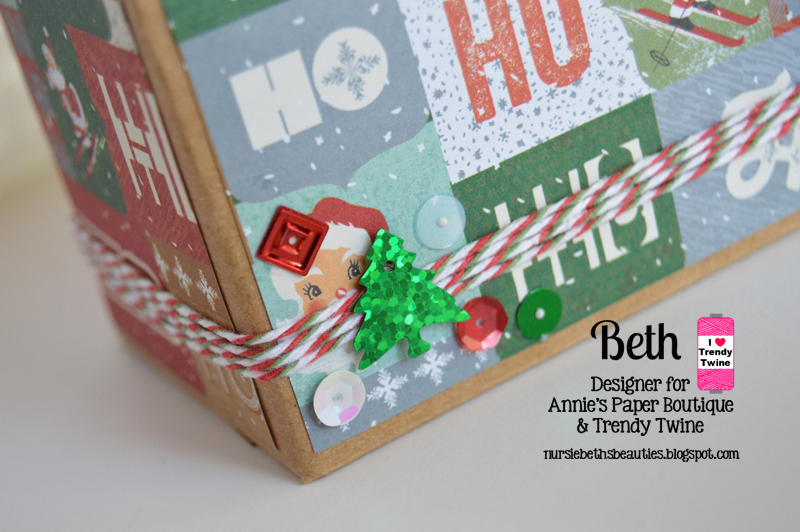 I wrapped Candy Cane Trendy Twine around the base of the box for an accent band and embellished it with sequins from the Christmas Shaker Medley. For the tag, I used a Biggie Kraft Tag with Metal Rim, added a die cut snowflake and then lined that with Candy Cane Trendy Twine. I added a long stamped tag behind the round one and added a few more sequins onto that. Now it is ready to fill with goodies to put a smile on someone's face! Trendy Twine: A Joyful Gift! It's Millie, from Crafting with Creative M, sharing a Joyous Gift that I made for one of my neighbors, featuring Candy Cane Trendy Twine, a Round Treat Tin along with Trendy Page Dots. 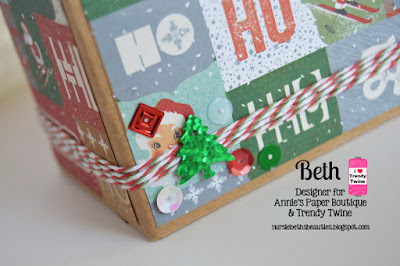 For my Joyous Gift, I used the pretty "Evergreen Stack" from DCWV to decorate my tin as well as my tags. It has been my go to holiday pattern paper this year. I used the "Joy" caption which I found on the DS. I placed red rhinestones to the center of each snowflakes and sprinkled them all around my treat tin. I made a gorgeous double bow with the mistletoe crinkle ribbon from 3GJ & the Candy Cane Twine. 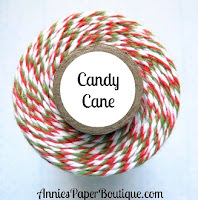 I wrapped Candy Cane Trendy Twine around my Treat Tin and made a pretty bow as well. 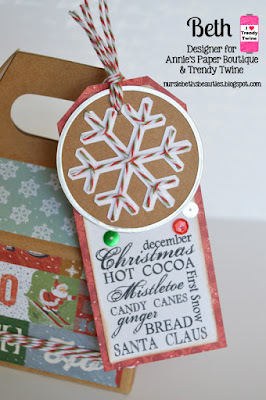 For my tags, I used the snowflake die cut from Winter Woodland. 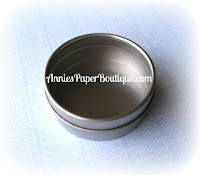 I adjusted the size so that the tags would fit perfectly inside of my treat tin. With the "write" feature I wrote "Merry Christmas" on each banner. This feature is becoming one of my favorite tool on the DS. I placed a Red & White Polka Dot-Trendy Page Dots and the I used the Crop-a-dile tool to place an eyelet on each tag. Then to finish off my tags I added some Candy Cane Trendy Twine. 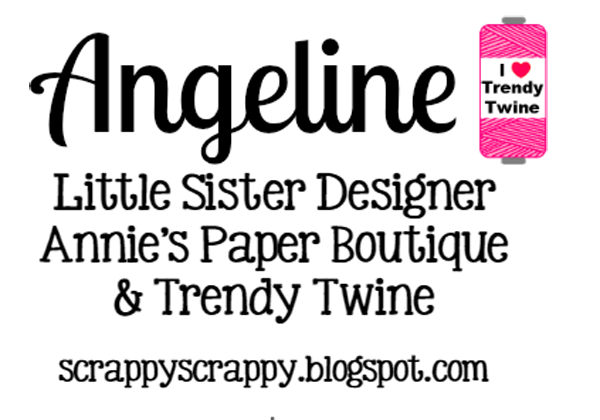 Trendy Twine - Happy Holidays! Trendy Twine - A Christmas Gift!